Ideal for garages, residential, commercial, warehouses, and office professional storage. Boltless shelving and racking units are strong, sturdy and easy to assemble. They can be put together using a mallet in just a matter of minutes. 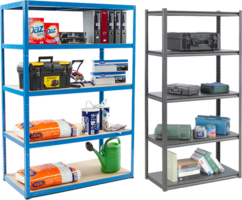 The heavy duty shelves with up to 400kg load capacity per shelf are suitable for storing heavy duty equipment such as power tools and other industrial equipment. Also available are shelves of lower load capacity from 60kg to 350kg, which is perfect for storage of lighter items in sheds, warehouses, storage rooms and workshops. Shelves come in a variety of colours, sizes and finishes to suit your desired style and design. Whether it's for residential, office, or industrial use, these shelving units can make a huge difference in the organization and workflow of your working area.